To describe pre- and post-methotrexate (MTX) therapy images from pelvic magnetic resonance imaging (MRI) with gadopentetate dimeglumine contrast following chemotherapy for post-partum hemorrhage secondary to placenta increta. A 28-year-old Caucasian female presented 4 weeks post-partum complaining of intermittent vaginal bleeding. She underwent dilatation and curettage immediately after vaginal delivery for suspected retained placental tissue but 28 d after delivery, the serum β-hCG persisted at 156 IU/mL. Office transvaginal sonogram (4 mHz B-mode) was performed, followed by pelvic MRI using a 1.5 Tesla instrument after administration of gadolinium-based contrast agent. MTX was administered intramuscularly, and MRI was repeated four weeks later. While transvaginal sonogram suggested retained products of conception confined to the endometrial compartment, an irregular 53 × 34 × 28 mm heterogeneous intrauterine mass was noted on MRI to extend into the anterior myometrium, consistent with placenta increta. Vaginal bleeding diminished following MTX treatment, with complete discontinuation of bleeding achieved by ~20 d post-injection. MRI using identical technique one month later showed complete resolution of the uterine lesion. Serum β-hCG was <5 IU/mL. Reduction or elimination of risks associated with surgical management of placenta increta is important to preserve uterine function and reproductive potential. For selected hemodynamically stable patients, placenta increta may be treated non-operatively with MTX as described here. A satisfactory response to MTX can be ascertained by serum hCG measurements with pre- and post-treatment pelvic MRI with gadopentetate dimeglumine enhancement, which offers advantages over standard transvaginal sonography. Abnormal placental invasion has traditionally been treated surgically with definitive diagnosis made at hysterectomy, based on extent of trophoblast extension determined by microscopic examination. For patients with placenta increta, non-invasive magnetic resonance imaging (MRI) technology offers a valuable tool for diagnosis and response to medical therapy. One such treatment is methotrexate (MTX), a potent folate antagonist proven useful in management of pathological placenta disorders. In this report, observations from MRI with gadopentetate dimeglumine contrast are correlated with clinical features associated with successful MTX therapy for placenta increta. A 28 year-old Caucasian sought evaluation for intermittent postpartum vaginal bleeding of about one month duration. Four weeks earlier, she had undergone an uncomplicated vaginal delivery of a 3100 g female infant. At delivery the placenta appeared intact and grossly normal. However, heavy postpartum bleeding required suction dilation and curettage within one hour of delivery due to suspected retained placental tissue. The patient was also placed on 5 mg methergine p.o. every 4 hours. These interventions reduced the vaginal bleeding and the hemoglobin was 9.2 g/dl when the patient was discharged home 48 h later. At one month post-partum, serum β-hCG level was 156 IU/L. General physical examination revealed no abnormalities. Her past medical and gynecologic history were unremarkable. Her obstetric history was significant for two spontaneous abortions (1 in 1996 and 1998) although neither required curettage. A normal spontaneous vaginal delivery occurred in 2001, and that postpartum course was remarkable for intermittent hemorrhage of 8 months' duration. This bleeding eventually necessitated two curettages and hysteroscopic resection of retained placental tissue. There was no history of any other pelvic or abdominal instrumentation. Utilizing a 1.5 Tesla instrument (Intera®, Philips Medical Systems; Eindhoven, The Netherlands), we obtained fat-saturated T1-weighted sagittal MRI sequence with 15 mg intravenous gadopentetate dimeglumine (Magnevist®, Berlex Inc.; Wayne, NJ USA) contrast enhancement. The study revealed an irregular 53 × 34 × 28 mm structure in the anterior myometrium impinging the endometrial cavity and projecting into myometrial tissue extending to within 5 mm of the anterior serosa (Figure 1). No myomas were noted. These findings agreed with transvaginal ultrasound (Figure 2) and were consistent with placenta increta. Fat-saturated post-contrast T1-weighted sagittal MRI demonstrating an enhancing irregular endophytic lesion with anterior myometrial (M) invasion, secondary to hypervascular placental tissue (arrow). Note layering contrast within bladder. 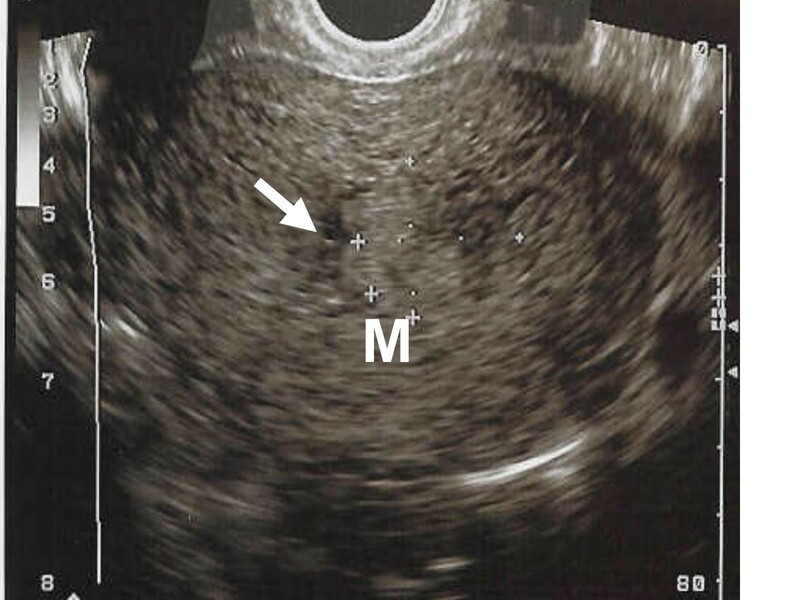 Transverse intravaginal ultrasound image of uterine corpus showing an irregular mass within the endometrium (arrow) and apparently normal underlying myometrium (M). The significance of the imaging results was discussed with the patient, and surgical and non-surgical treatment strategies were presented. Particularly given the patient's wish to preserve uterine function for future pregnancy, it was decided to administer 60 mg MTX I.M. after obtaining informed consent. Hematologic, liver, and renal function were evaluated and found to be normal before MTX injection. No untoward effects were experienced following MTX administration, and vaginal bleeding diminished gradually over 4 weeks. 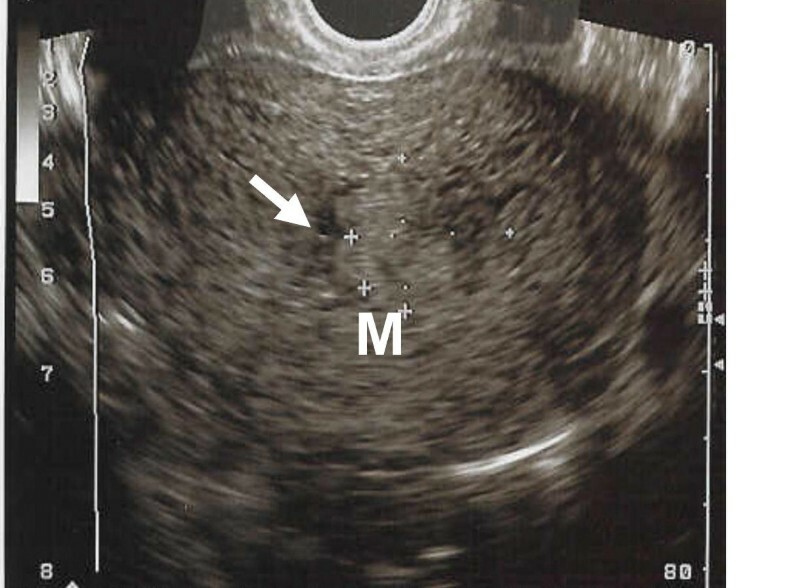 To avoid further intrauterine instrumentation (i.e., diagnostic hysteroscopy), follow-up MRI with identical technique was performed 4 weeks after MTX therapy to assess treatment response. Complete resolution of the uterine lesion was confirmed (Figure 3). Serial β-hCG was undetectable (<5 IU/mL) ~20 d after MTX injection. Follow-up MRI using identical technique 4 weeks post-MTX therapy, showing normal myometrium (M) and absence of placental tissue (arrow). Abnormal placental adherence is believed to result from pathological absence of intervening uterine decidua basalis and fibrinoid layer of Nitabuch. Placental villi are inappropriately attached to myometrium in placenta accreta, invade myometrium in placenta increta, and extend through the myometrium (beyond uterine serosa) in placenta percreta. The present report describes placenta increta, a rare but life-threatening complication of pregnancy with an estimated incidence of between 1:2500 to 1:1900 gestations [1–3]. More recently, this incidence has risen with the increased cesarean delivery rate. Placenta increta is associated with considerable maternal morbidity and mortality. Indeed, most cases of placenta increta require hysterectomy to achieve adequate hemostasis . Although hysterectomy remains the definitive therapy for placenta increta, conservation of the uterus is desired for future fertility by some women. For this reason, less extreme surgical approaches including wedge resection of affected myometrium have been proposed as another method permitting subsequent pregnancy . MTX is a potent antimetabolite, with mechanisms of action including inhibition of trophoblast cells, reduction of placental neovascularization, and attenuation of placental growth factors [5, 6]. Our patient's history included known risk factors for placenta increta, including previous abortion, dilatation and curettage, and manual removal of the placenta. Concurrent placenta previa, submucous fibroids, prior cesarean delivery and multiparity are other recognized risk factors for placenta increta . Some investigators have found increased serum alpha-fetoprotein levels, increased serum β-hCG, and maternal age >35 y to be associated with a higher frequency of placenta increta . 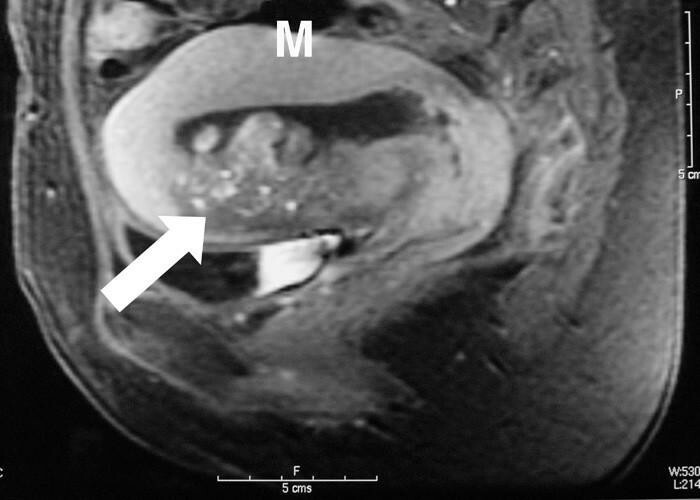 While application of MRI technology in gynecology practice has been described previously , other investigators have noted the paucity of MRI reports specific to placental or uterine lesions . 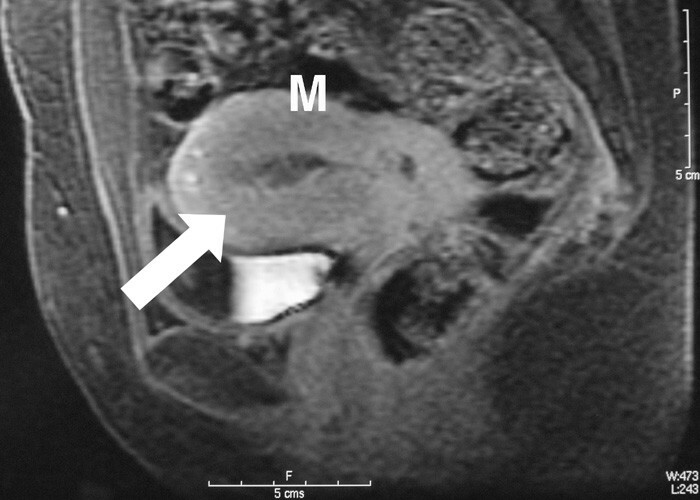 We utilized MRI with contrast enhancement to visualize decidua basalis at the placental margins , since images from standard B-mode transvaginal ultrasound suggested only retention of tissue within the endometrial cavity. The additional information derived from MRI permitted the diagnostic refinement needed to counsel the patient appropriately regarding chemotherapy. For our patient, a satisfactory therapeutic response to MTX was shown by declining serum hCG levels and confirmed by contrast-enhanced MRI, thus obviating the need for diagnostic hysteroscopy and possible hysterectomy. Placental invasion of the myometrium may be difficult to discern from routing transvaginal ultrasound, particularly without optimal color Doppler capability. Accordingly, utilization of MRI with gadopentetate dimeglumine enhancement to confirm resolution of abnormal placentation warrants consideration in such clinical settings. The present case illustrates a successful non-operative management strategy for placenta increta utilizing MTX, which resulted in complete placental resorption as demonstrated by comparison of pre- and post-treatment MR with gadolinium contrast. SAW and LMG were the resident physicians associated with the case. KTC was the lead obstetrician and primary physician at delivery. MP was the reproductive endocrinologist, and DGS was the radiologist. ESS conceived of the research, directed the residents, and coordinated manuscript revisions. Written consent was obtained from the patient for publication of this manuscript.